Background and objectives: Drugs are public health problem in terms of mental and physical impairments. As respect to the physical commitments, addicted people present severe motor coordination and balance disturbances. The aim of this study was to evaluate the effect of exergames on the rehabilitation of motor coordination and balance in recovering drug addicts. Participants and methods: This is a prospective non-randomized, self-controlled study. Nine male addicts aged 25.78 ± 6.76 years were recruited from the Rescuing Lives Center for Recovery from Alcohol and Drugs, Altamira, Brazil. The intervention consisted of sixteen 45-minute sessions involving the use of virtual reality games (Xbox 360 Kinect console). Evaluations were performed before and after the intervention. The static and dynamic balance was accessed by the Berg Balance Scale, Timed Up and Go test and 6-minute walk test. The motor coordination was assessed by the Senior Motor Scale. Gait was also analyzed using an inertial sensor (G-Walk). This study was conducted at the Rescuing Lives Center for Recovery from Alcohol and Drugs, Altamira, Brazil and received approval from the Human Research Ethics Committee of the Universidade do Estado do Pará - XII Campus (certificate number: 2.129.360) on April 7, 2017. Written informed consent was obtained from each participant. Results: Significant improvements were found in the Berg Balance Scale, Senior Motor Scale and Timed Up and Go test (sitting and standing) after intervention (P < 0.05 or P < 0.01), whereas no significant change occurred on the six-minute walk test (P > 0.05). Conclusion: Virtual reality is a promising technology for improving motor coordination and balance in recovering drug addicts. According to Souza et al. 's study, the organization of cognitive functions and psychomotor self-control are impaired in addicts, since the prefrontal cortex is damaged by the daily use of drugs. As consequence, the addict has difficulties in performing some activities of daily living. Moreover, the neuromotor pathways are also impaired by excessive drug use, causing serious problems with regard to static and dynamic balance. During the withdrawal phase in recovering addicts, the practice of aerobic activities promotes an increase in the metabolic demand. It results in the adaptation of the main neural pathways and offers benefits, such as the normalization of the levels of attention, memory and motor control. Virtual reality is an option that enables achieving improvements in motor coordination and balance by the practice of body movements through pleasurable physical activities. However, few studies have addressed treatment with virtual reality for improving balance and motor coordination in addicts. Therefore, the aim of the present study was to evaluate the influence of virtual reality in rehabilitation of motor coordination and balance in drug addicts recovering. Our hypothesis is that gait training with virtual reality is capable of improving balance and motor coordination in this population. Subjects were recruited from May to July 2017. Interventions and evaluations were carried out from August to October 2017. This study was conducted at the Rescuing Lives Center for Recovery from Alcohol and Drugs, Altamira, Brazil and received approval from the Human Research Ethics Committee of the Universidade do Estado do Pará - XII Campus (certificate number: 2.129.360) on April 7, 2017 (Additional file 1 [Additional file 1]) and in accordance with the Declaration of Helsinki. All participants received clarifications regarding the procedures of the study and signed a statement of informed consent (Additional file 2 [Additional file 2]). The addicts participated in sixteen 45-minute training sessions at a frequency of twice a week. Each participant stood two to three meters in front of the Kinect Xbox 360TM motion sensor (Microsoft Corporation, Redmond, WA, USA) and a 40′′ television reproduced the images of the following games: Just Dance 2016, Kinect Adventures, Game Kinect Sports and Game Kinect Sports 2. The Berg Balance Scale (BBS) was used to evaluate functional balance. This scale is based on 14 items common to daily living and is used for patients in rehabilitation for the treatment of balance deficits, independently of age. Each item is scored on a five-point scale from 0 (unable to perform the task) to 4 (able to perform the task independently). The total is determined by the sum of the item scores and ranges from 0 (severely impaired balance) to 56 points (excellent balance). A score of less than 45 points is a predictor of recurrent falls. Motor coordination was assessed using the Senior Motor Scale (SMS) adapted and developed by Rosa (2009). The SMS is a battery of tests used to evaluate general motor fitness in terms of global coordination, balance and agility. For each of these variables, a sequence of levels from two to 12 is proposed in the form of tests that gradually increase in difficulty. The score is calculated individually for each of the motor aspects by the sum of positive results on the tests. The scale is indicated for individuals at risk of motor impairment, those with a sedentary lifestyle and those with mental, psychological and neurological behavior disorders. A portable, wireless, inertial sensor (G-WALK, Gsensor, BTS Bioengineering SpA, Garbagnate Milanese, Italy) was used for the evaluation of spatiotemporal gait parameters, Timed Up and Go (TUG) test and 6-minute walk test (6MWT). The device was attached to the participant's waist with a semi-elastic strap at the height of the L4–5 intervertebral space. G-WALK is composed of a 16-bit triaxial accelerometer with a multiple sensitivity axis (± 2, ± 4, ± 8 and ± 16 g), 13-bit triaxial magnetometer (± 1200 μT) and 16-bit triaxial gyroscope with a multiple sensitivity axis (± 250, ± 500, ± 1000 and ± 2000 °/s). The time (in seconds) for the following phases were computed: standing time; going phase; first rotation; back phase; and final rotation – sitting phase. For the standing and sitting phases, the following trunk angles (in degrees) were computed: flexion peak; flexion range of motion; extension peak; and, extension range of motion. 6MWT was performed in a flat corridor on which 30 meters were marked at one-meter intervals. The width of the track was 1.5 meters and the participants performed the test without assistance following the guidelines of the American Thoracic Society (2005). The participant was instructed to walk as fast as possible for six minutes with standardized verbal encouragement at one-minute intervals. The inertial sensor was used to measure the distance traveled (in meters) during the test. Physiological variables were determined before and after the 6MWT. Heart rate was measured using a pulse heart rate monitor (Polar®, model 90440, Kempele, Finland). Blood pressure was measured using a digital monitor (G-Tech BP3AF1-3, Onbo Electronic (Shenzhen) Co., Ltd., Shenzhen, China) with the participant in the sitting position. Perceived exertion was evaluated using the modified Borg scale which ranges from 0 (no effort) to 10 (extreme effort). Data are expressed as the mean ± SD. The IBM SPSS Statistics v.22 software (IBM, Armonk, NY, USA) was used for the statistical analysis. The data fulfilled the criteria of normality, as determined by the Kolmogorov-Smirnov test. The paired samples t-test was used for the comparisons, with the level of significance set to 5% (P < 0.05). Nineteen individuals characterized as addicts initiated the evaluations and training sessions. Dropouts occurred over the course of the sessions due to the abandonment of treatment due to health reasons or personal problems. Thus, only nine individuals completed the training and were submitted to the second evaluation [Figure 1]. Mean age was 25.78 ± 6.76 years; weight was 65.56 ± 9.88 kg; height was 1.69 ± 5.52 meters; and duration of drug use was 13.5 ± 5.78 years. The most consumed drugs prior to hospitalization were marijuana, cocaine, crack, cigarettes and alcohol. During their stay at the Rescuing Lives Center for Recovery from Alcohol and Drugs, the participants were not taking any drugs. Note: SMS: Senior Motor Scale; TUG: Timed Up and Go; BBS: Berg Balance Scale; 6MWT: 6-minute walk test. Significant improvements were found on the clinical scales: BBS (P < 0.01) and SMS (P < 0.01). [Table 1] presents these results. 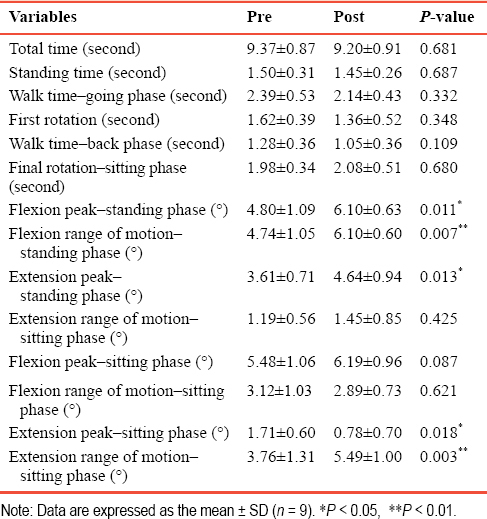 No significant differences were found regarding the spatiotemporal gait variables [Table 1]. However, for the TUG test, significant improvements post-intervention were found in the standing (flexion peak (P = 0.011); flexion range of motion (P = 0.007); extension peak (P = 0.013)) and sitting phases (extension peak (P = 0.018); extension range of motion (P = 0.003)). [Table 2] displays the TUG test results. The [Table 3] displays the distance traveled on the 6MWT and physiological variables before and after the test. The minimum blood pressure (P = 0.031) improved after the intervention. No significant differences were found for the other variables analyzed. The present study evaluated the influence of virtual reality training on motor coordination and balance in recovering addicts. According to Rocha et al. (2012), virtual reality is a promising rehabilitation modality with the aim of enhancing motor performance, learning motor strategies and relearning motor skills lost due the harm caused by drug use. Improvements in static and dynamic balance were found, as demonstrated by the results of the BBS. This finding is in agreement with data previously described,,, which also showed remarkable improvements in balance following the use of virtual reality in population with movement disorders. Enhancements in motor coordination after virtual reality training were also found, as demonstrated by the results of the SMS. This finding is consistent with the data described by Araújo et al. and Pavão et al., who reported significant improvements in the Motor Development Scale in patients with motor coordination deficit submitted to virtual reality training. In the present study, an inertial sensor was employed to quantify the TUG and the 6MWT. Unlike the conventional TUG test, in which only the total time required to complete the task is recorded, the inertial sensor can determine the total time as well as the time required for the different components of the test (standing up, walking three meters, turning 180º, returning to the chair and sitting down again) as well as acceleration data, which are important data that reveal the quality of movement and specific mobility problems. This is known as the instrumented TUG test.,,, The data revealed noticeable improvements during the standing and sitting phases of the test, demonstrating the benefits of virtual reality training with regard to these aspects. According to previous results, virtual reality increases dopamine in the brain. Therefore, the authors state that such training leads to significant improvements in mobility and balance. Although no difference was found on the 6MWT, the participants walked a longer distance after the intervention (mean: 362 meters prior to training and 419 meters after training). A previous study involving virtual reality training found the difference in the distance travelled on the 6MWT, demonstrating an increase in functional independence. Previous studies, have demonstrated that the practice of physical activity leads to improvements in both balance and motor coordination, diminishing the possibility of falls. When the physiological variables were analyzed, differences were found with regard to minimum blood pressure. The participants had a minimum blood pressure below normal limits prior to the intervention, which had increased to the normal range following the virtual reality training sessions. Nogueira et al. report similar results and confirm the benefit of systematized physical activity administered by physical educators on the maintenance of blood pressure. The present study has limitation that should be addressed. The lack of a control group limits the comparisons of the findings. Moreover, the dropouts that occurred during the training sessions due to personal reasons and health problems diminish the statistical power of the findings. In the present study, virtual reality training performed with the Xbox 360 Kinect system resulted in improvements in recovering motor coordination and balance in drug addicts, as demonstrated by results of the BBS, SMS and instrumented (inertial sensor) TUG test. Additional file 3 [Additional file 3]: Data sharing. Conception of the study: ANS and JTFB; data acquisition, analysis and interpretation, and the drafting of the manuscript: AJLD and AFRK; study design and performance: GELM. All authors approved the final version of the paper. The study had been approved by the Ethics Committee of Universidade do Estado do Pará - XII Campus (certificate number: 2.129.360) on April 7, 2017. The study was performed in strict accordance with the Declaration of Helsinki. The authors certify that they have obtained all appropriate participant consent forms. In the forms, participants have given their consent for their images and other clinical information to be reported in the journal. The participants understand that their names and initials will not be published and due efforts will be made to conceal their identity, but anonymity could not be guaranteed. The biostatisticians of the University of State of Para reviewed the statistical methods of this study. Individual participant data that underlie the results reported in this article, after de identification (text, and tables), will be available upon request. Data will be available immediately following publication, no end date; for anyone who wishes to access the data. In order to gain access, data requestors will need to sign a data access agreement. Proposals should be directed to anafrkleiner@gmail.com. United Nations Office on Drugs and Crime of 2015. Unodc. 2015. Alvarez SQ, Gomes GC, Xavier DM. Causes of addiction and its consequences for the user and the family. Rev Enferm. 2014;8:641-648. Souza AL, Cintrão JM, Silva ME, Guimarães AC, Parcias SR. Motor ability and attention span among individuals dependent on illicit psychotropic drugs. Acta Fisiatr. 2012;19:151-155. Zschucke E, Heinz A, Ströhle A. Exercise and physical activity in the therapy of substance use disorders. Sci World J. 2012;2012:901741. Souza AC, Gomes EF, Vale TC, Patrocínio VR, Sousa LA. Rev Med Minas Gerais. 2013;2:161-165. Ryan RM, Rigby CS, Przybylski A. The Motivational Pull of Video Games: A Self-Determination Theory Approach. Motiv Emot. 2006. Bao X, Mao Y, Lin Q, et al. Mechanism of Kinect-based virtual reality training for motor functional recovery of upper limbs after subacute stroke. Neural Regen Res. 2013;8:2904-2913. Hondori HM, Khademi M. A review on technical and clinical impact of microsoft kinect on physical therapy and rehabilitation. J Med Eng. 2014;16:846514. Melo GE, Kleiner AF, Lopes JB, et al. Effect of virtual reality training on walking distance and physical fitness in individuals with Parkinson's disease. NeuroRehabilitation. 2018;42:473-480. Melo GE, Kleiner AF, Lopes JB, et al. Effects of virtual reality training on mobility in individuals with Parkinson's disease. Gait Posture. 2018;65:394-395. Lupo A, Cinnera AM, Pucello A, et al. Effects on balance skills and patient compliance of biofeedback training with inertial measurement units and exergaming in subacute stroke: a pilot randomized controlled trial. Funct Neurol. 2018;3:131-136. Rosa NF. Manual of motor skills assessment for the elderly. Porto Alegre: Artmed. 2009. Podsiadlo D, Richardson S. The timed ‘Up & Go’: A test of basic functional mobility for frail elderly persons. J Am Geriatr Soc. 1991;2:142-148. ATS Committee on Proficiency Standards for Clinical Pulmonary Function Laboratories. ATS statement: guidelines for the six-minute walk test. Am J Respir Crit Care Med. 2002;166:111-117. Borg GA. Psychophysical bases of perceived exertion. Med Sci Sports Exerc. 1982;5:377-381. Rocha PR, Defavari AH, Brandão PS. Study of the feasibility of using Kinect as a tool in the physiotherapeutic care of neurological patients. Proceedings Of Sbgames. 2012. Silva WH, Lopes GL, Yano KM, Tavares NS, Rego IA, Cavalcanti FA. Effect of a rehabilitation program using virtual reality for balance and functionality of chronic stroke patients. Motriz: rev educ fis. 2015;3:237-243. Silva RR, Marchese CI. Using virtual reality for motor rehabilitation in a child with ataxic cerebral palsy: case report. Fisioter Pesq. 2015;1:97-102. Lopes GL, Yano K, Tavares NS, et al. Influence of virtual reality treatment for balance in a patient with cerebral palsy. Rev Ter Ocup Univ Sao Paulo. 2014;2:121-126. Araújo MH, Magalhães FG, Lisita CC, Júnior JT. The influence of a weathered training program of 20 weeks in fine motricity, global motricity and balance in older. Rev Educ Saúde. 2016;4:1. Pavão SL, Arnoni JB, Oliveira AK, Rocha NA. Impact of a virtual reality-based intervention on motor performance and balance of a child with cerebral palsy: a case study. Rev Paul Pediatr. 2014;4:389-394.
van Lummel RC, Walgaard S, Hobert MA, et al. Intra-rater, inter-rater and test-retest reliability of an instrumented Timed Up and Go (iTUG) test in patients with Parkinson's disease. PLoS One. 2016;3:e0151881. Van Uem JM, Walgaard S, Ainsworth E, et al. Quantitative Timed-Up-and-Go parameters in relation to cognitive parameters and health-related quality of life in mild to-moderate Parkinson's disease. PLoS One. 2016;4:e0151997. Galli M, Coghe G, Sanna P, Cocco E, Marrosu MG, Pau M. Relationship between gait initiation and disability in individuals affected by multiple sclerosis. Mult Scler Relat Disord. 2015;6:594-597. Kleiner AF, Pagnussat AS, Prisco GD, et al. Analyzing gait variability and dual-task interference in patients with Parkinson's disease and freezing by means of the word-color Stroop test. Aging Clin Exp Res. 2018;9:1137-1142. Herz NB, Mehta SH, Sethi KD, Jackson P, Hall P, Morgan JC. Nintendo Wii rehabilitation (“Wii-hab”) provides benefits in Parkinson's disease. Parkinsonism Relat Disord. 2013;11:1039-1042. Cacau LA, Oliveira GU, Maynard LG, et al. The use of the virtual reality as intervention tool in the postoperative of cardiac surgery. Rev Bras Cir Cardiovasc. 2013;2:281-289. Sherrington C, Fairhall NJ, Wallbank GK, et al. SE. Exercise for preventing falls in older people living in the community. Cochrane Database Syst Rev. 2019;1:CD012424. Sherrington C, Michaleff ZA, Fairhall N, et al. Exercise to prevent falls in older adults: an updated systematic review and meta-analysis. Br J Sports Med. 2017;24:1750-1758. Nogueira IC, Santos ZM, Mont´Alverne DG, Martins AB, Magalhães CB. Effects of exercise on hypertension control in older adults: systematic review. Rev Bras Geriatr Gerontol. 2012;3:587-601.